A recent report from One Click Retail reveals that the Amazon-Whole Foods merger may be an even bigger threat to Big Grocery than previously imagined. According to the analysis, Amazon’s market share of U.S. online grocery sales reached 18% in 2017, double that of Walmart, its closest competitor. 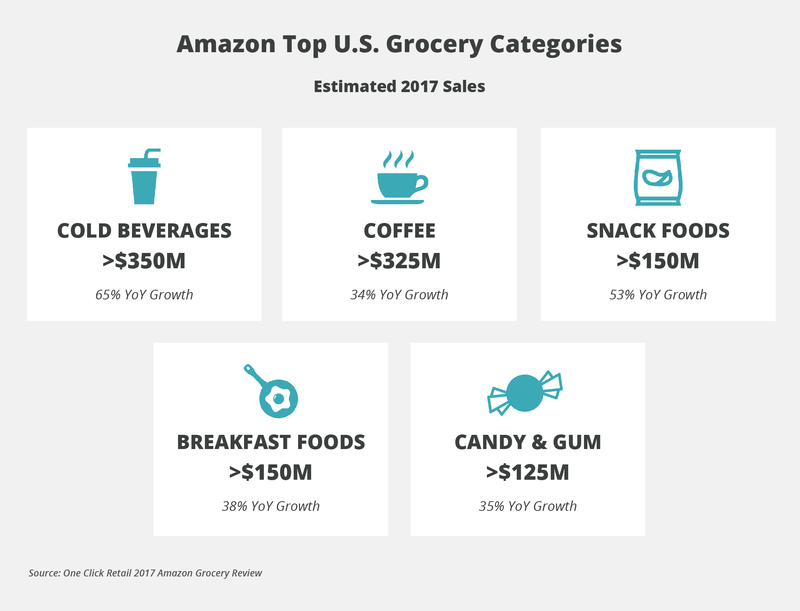 The 2017 Amazon Grocery Review reports that Amazon sold an estimated $2 billion in food and beverages last year, up 59% from 2016. These numbers only account for Amazon’s direct sales and do not include those of its marketplace sellers. This increase is largely due to the private-label brands that Amazon acquired when it purchased Whole Foods for $13.7 billion. Whole Foods’ 365 Everyday Value brand, for example, is now Amazon’s second best-selling private-label brand. This is particularly astonishing when you consider the fact that 365 Everyday Value products weren’t even available on Amazon until late August 2017. 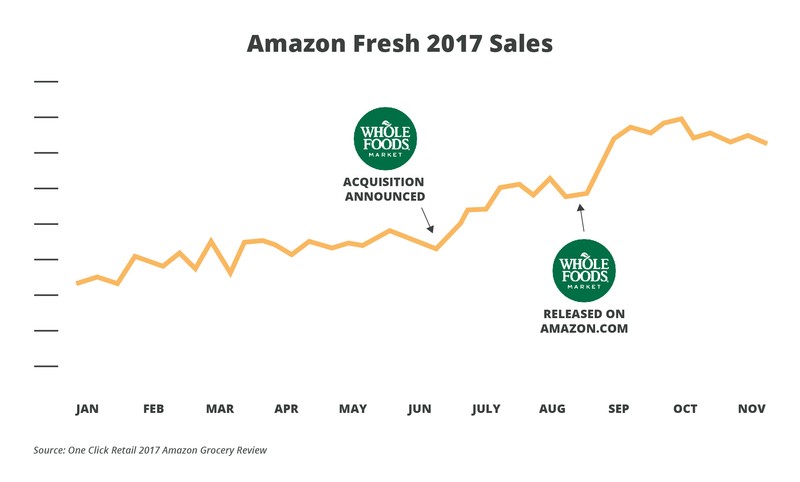 The growing popularity of Amazon Fresh, the company’s grocery delivery service, has also influenced this growth. According to the report, weekly sales more than doubled from an estimated $3 million in January 2017 to over $7 million by December 2017, reaching approximately $350 million in total sales. What does this mean for CPG brands? To better understand the effects of Amazon’s grocery dominance on today’s CPG brands, we consulted six industry experts. Here’s what they had to say. “As much as Amazon is a lucrative sales channel for any brand, this is potentially worrisome news for CPG firms. The danger of Amazon becoming more dominant in online grocery is that it weakens the power of CPG firms to control how their brands are promoted and displayed. In store, it is relatively easy to expose consumers to brands they walk by. When online, unless brands are near the top of search results or category pages, they are unlikely to be seen by consumers. Since Amazon controls how their site and its search functionality works, they may choose to prioritize their own brands – especially Whole Foods labels – and promote them across devices such as Echo and Show. “For CPG companies, Amazon’s growing dominance is a ‘be careful what you wish for’ proposition. These brands have been trying to figure out how to scale in the digital space, and for some, Amazon seemed like a knight on a white horse initially. But if CPGs think of Amazon as a welcome escape from controlling brick and mortar based customers, they have another thing coming. Amazon has complete control over its platform – it is the chief merchant – and as such, it can easily show favor to its owned brands, including those that came as part of the Whole Foods deal. Amazon is also relentless on economics. Gone are the days when Amazon was happy to have brand relationships. Now it holds the upper hand in innumerable ways, including exerting price pressure. The exponential increases that are already registering should only be the tip of the iceberg. Non-perishable products are a gateway that will prime the pump (pun intended) for forays into fresh – Amazon Fresh – as it expands into new markets. There may even be pent-up demand at that point that benefits any fresh foray Amazon makes. "Gone are the days when Amazon was happy to have brand relationships." “Considering this report is autonomous of third-party seller data, as well as the short time period in which Amazon achieved this goal, the numbers may seem a bit daunting to enterprise brands looking to launch their newest in grocery. 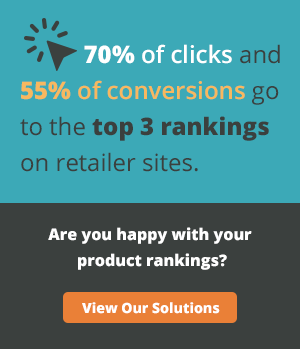 With over 170M monthly visitors to the U.S.-based Amazon.com site alone, the incredible brand awareness opportunity and growth potential the platform brings confirms the necessity of having a presence on this marketplace. Meanwhile, underbelly feelings vacillate on whether the margins will be there to sustain a new product in the long term against the well-oiled Amazon behemoth machine. Consumers tell us loudly and clearly what it is they want. Brands need to listen before, during and after development. With flexibility, recognition and quick adoption of new ideas, guided by the consumer demand, brands can compete. Content Team: Brands need to optimize their listings with illustrative images and educational videos on how and why to use their products as well as benefit-rich descriptions peppered with consumer-based search terms. Care Team: A strong social care team trained on identifying and tagging all customer product reviews on Amazon and comments across email, chat and social media handles; then feeding that valuable information back to the product development and brand teams with an agile culture ready to adapt their products to meet consumers’ needs. "With flexibility, recognition and quick adoption of new ideas, guided by the consumer demand, brands can compete." “Now that we’re 6 months into the Amazon-Whole Foods transition, research and data are starting to allow us to quantify what industry rumblings have been saying for months: that Amazon’s foray into the physical grocery world via Whole Foods should be incredibly worrying for CPG firms. Furthermore, Amazon’s physical grocery presence has sent its e-commerce grocery business skyrocketing. "The fast growth trajectory of Amazon's CPG sales show that we may be near a watershed moment for grocery." “Most CPG brands are fully aware of the threat and opportunity that Amazon poses, especially after the Whole Foods acquisition. The problem is that many of them don’t have the resources, speed and agility necessary to compete with the onslaught newer, more innovative brands. For traditional CPG companies, creating the internal infrastructure required to keep pace may take too long. Before they realize that speed is not optional, they’ll have already lost their market share to technology-focused startup brands who were built from the ground up with Amazon in mind. Succeeding in this environment will require brands to partner with service and technology providers who can get their e-commerce operations up to speed fast – and when I say fast, I mean days or weeks, not months or years. OneSpace is the only platform designed to help brands achieve the perfect digital shelf. By combining the industry’s largest database of consumer search insights with proprietary performance monitoring tools and on-demand content optimization services, we enable brands to respond to market changes and execute product page updates with unrivaled speed and scale. Since 2012, our solution has been an operational cornerstone for the world’s largest online retailers, including Instacart, Jet.com, Office Depot, Chewy, Lowe’s, Overstock and more. Today, it’s being used to power e-commerce operations for some of the world’s most successful brands. Want to see how OneSpace can help you dominate the digital shelf? Click here to learn more.